Rock climbing is a skill sport but it’s also physically demanding. You can be good at it, but being stronger make you better. Climbers have to condition themselves to deal with the most difficult routes. There will be twists, small holds that barely fit the feet and finger tips, and slippery rocks. Suddenly, hanging off a cliff becomes dangerous. 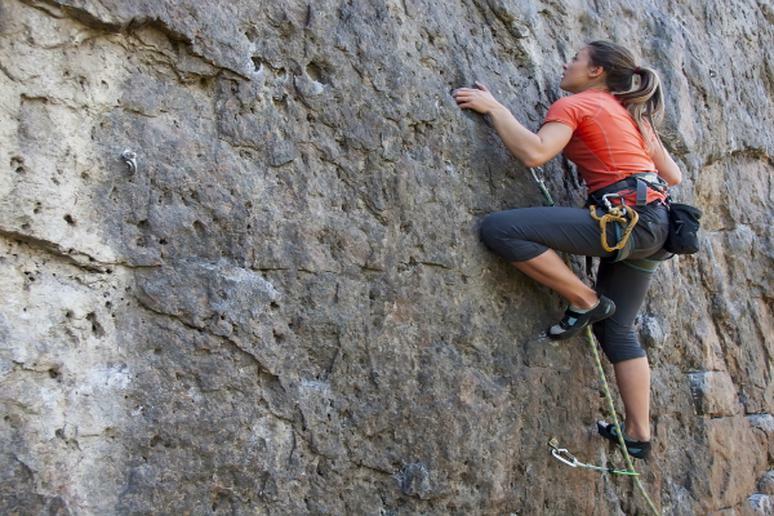 Whether you’re bouldering, sport or trad climbing, your body needs to be in good shape. Strong arms and core, flexibility and balance are key because you need to move your body as powerfully as possible. Rock climbing is a leisure activity, even though it’s very challenging. It takes quite a lot of your spare time and, on top of that, you have to train for it. Who has the time for that? A few short but intense workouts will suffice. “Pull-ups are definitely very helpful,” Laine says. “You are focusing on upper body strength.” It’s important to move slowly when you perform the exercise. You won’t be climbing fast anyway. You’ll need to maintain balance and have control. So, slow down until you feel that even doing 15 pull-ups is difficult. Go as high as you can. The plank is often regarded as the single best exercise for strong core. It’s good to do it if you’re a climber because it helps with balance and positioning. Your core muscles become especially important when you are on a tough route where the climbing holds are small and you need to stay balanced. This isometric exercise requires you to rest your weight in your arms, not the hands. Form a straight line and tighten your belly. Hold that position for as long as you can and repeat a few times. “Traversing is very important when you’re climbing across the wall as opposed to straight up,” Laine says. “Look out for really small holes in the gym so you can focus on how to handle them and not be blindsided and surprised outside,” she adds. Traversing is also a great way to build endurance and improve technique. To make it more challenging, set a timer and just climb. Keep climbing until your hands get weak. This exercise is good because it improves your grip. You have to hang on to holds, some of which are very small, all the time when climbing and you need to know how to best do that. The longer you can count on your hands, the more time you have to figure out your next move and rest other muscles. The exercise is pretty simple – just hold on to something heavy with one hand. Hold for as long as you can and switch. This is an awesome exercise for balance, quickness and coordination. You are engaging your arms, core and legs all at the same time, making your muscles work hard so you can maintain balance and move your body in a controlled motion. Running helps to improve your endurance. If you haven’t run in a long time, or ever, start small. Mix it up by doing intervals – running followed by walking at an incline. Build your leg strength. This is one of the hardest exercises but it’s worth every drop of sweat. Don’t cheat; go down on one leg until your glutes touch your foot. Do each leg for half a minute. One you master that basic move, add weights to make the exercise a bit harder.